Start your day with a healthy lap around Lake Phalen; signup for the annual do. walk/run, sponsored by Blue Cross Blue Shield. Marvel at dances from the ceremonial to the theatrical, with varied colors and authentic costumes! Taste authentic Asian foods from amazing Asian restaurants throughout the Twin Cities. See beautiful cultural arts, authentic merchandise to purchase, and meet a variety of community organizations with resource information from our communities. Enjoy activities for children of all ages. 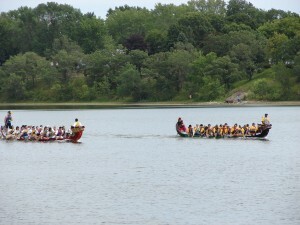 Teams compete in the Dragon Boat races on Phalen Lake. Most important, come cheer on the exciting, competitive, and fun Dragon Boat racers. The Dragon Festival is a nonprofit, all volunteer organization. 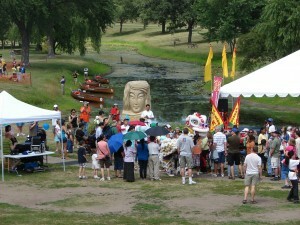 Volunteers plan and operate the Dragon Festival for the greater good. We value all of you as participants in any of these programs. 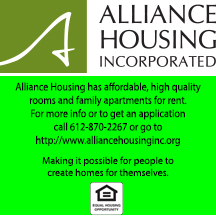 We are always in need of volunteers annually. If you are interested, please complete the following application online. www.dragonfestival.org. • do. walk/run: 5k walk/run around Lake Phalen, sponsored by Blue Cross Blue Shield. Register at www.dragonfestival.org/do-runwalk.html from April 23 through July 12. • Cultural & Martial Arts Performers: We are in search for cultural & Martial Arts performers. Your performance at the Dragon Festival will provide exposure to thousands of spectators, the opportunity to share your talents, as well as there is guaranteed media exposure for your organization. Register at www.dragonfestival.org/as-a-martial-artist.html from April 23 through July 1. • Food, Merchandise, and Resource Vendors: We would love to provide a venue for you to share your delicious authentic Asian foods at our festival for the thousands of spectators that visit us for the two days. Come too and sell your beautiful crafts, arts, and Asian gift. 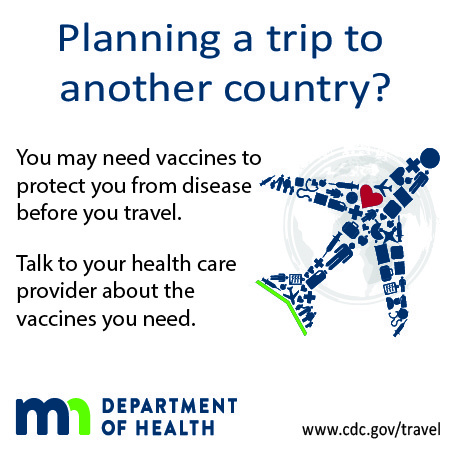 Additionally, increase your reach by providing resources and information about your nonprofit and services you provide to Minnesota’s communities. Register at www.dragonfestival.org/as-a-vendor.html from April 23 through July 1. • Boat Race Teams: You can gather your friends to build your own or ask your company to sponsor your employees as a Health and Wellness activity. This is a one day event for your team, first come first serve to choose what day you want to race, Saturday or Sunday. Anyway you can form a team; we always welcome you; the more teams the more exciting the completion gets. Please consider in joining us to race. Register at www.dragonfestival.org/as-a-dragon-boat-team.html from April 23 through July 1, 2014. We hope that you will continue to engage with us in creating one of the best Pan-Asian cultural events in the Twin Cities. By the end of the two day festival, our goal is to have built community and establish collaborations with similar organizations in order to provide an incentive for Asian-Pacific Americans to participate in outreach programs from various community organizations. The spirit of the Dragon Festival has always been about building community through the sharing of our cultural heritage.